Level 7 Team with their 4th Place Trophy. Back Row- Left to Right: Morgan Adams, Kathryn Eggerling, Kelsey Knuth, Josie Spitz, Tatum Graham, Moira Dillow, Jaxi Melby and Alyssa Strong. Front Row- Left to Right: Sidney Stizki, Sierra Gosh, Aryn Archambeau, Kairey Vela and Abbie McCrimmon. 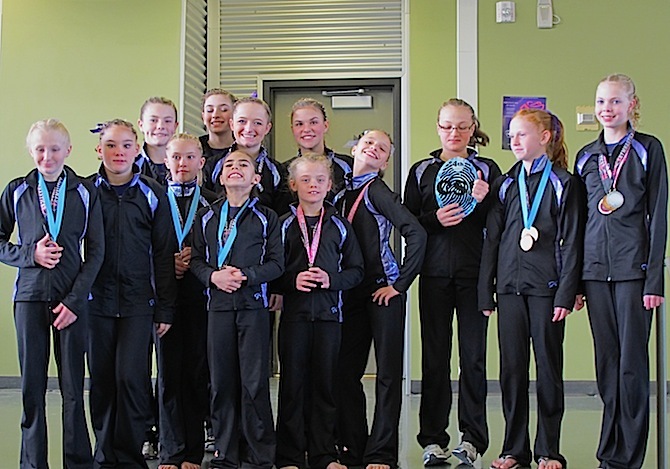 Premier Gymnastics of the Rockies had their final meet of the season before the State Invitationals. They competed in the 2012 Colorado Sky Invitational at Bear Creek High School, hosted by Jet Gymnastics on March 10 and 11. Level 10 gymnast, Bailie Holst, took the title once again as the All-Around Champion (Score 35.850) in the 16-year-old Division. Holst placed 1st on Vault (9.500) and Beam (9.000). She also placed 4th on Bars and 5th on Floor. Level 8 gymnast, Rachel Rost, placed 5th All-Around in the 14+ Division. Rost placed 3rd on Vault, 4th on Bars and 5th on both Beam and Floor. Level 7 Placed 4th as a Team. Jaxi Melby Placed 5th in the Child Division. Sidney Strizki Placed 5th in the Junior Division. Alyssa Strong Placed 4th in the Senior Division. In the Child Division, Abbie McCrimmon Placed 1st on Bars (9.700). Melby Placed 4th on both Vault and Bars. Kairey Vela Placed 4th on Beam and 5th on Bars. In the Junior Division, Strizki Placed 1st on Bars (9.600). Aryn Archambeau Placed 5th on Beam. Tatum Graham Placed 2nd on Vault and 4th on Floor. Morgan Adams Placed 2nd on Bars, 3rd on Vault and 5th on Floor. In the Senior Division, Strong Placed 2nd on Beam and 5th on Bars. Josie Spitz Placed 3rd on both Vault and Bars. Kelsey Knuth Placed 5th on both Vault and Floor. Level 8 and 10 State Invitationals will be held in Colorado Springs, hosted by Aerials, on March 24 and 25. Level 7 State Invitational will be hosted and held at Gymnastics Unlimited on March 31 and April 1.